All of the books in this section are in print and available for immediate shipping (unless otherwise stated). Can't find the title that you were looking for here? Check our Out-of-Print category. Still don't see it? Contact us and we'll do our best to find one for you. This book tells the Real History of the heroic RAF moonlight attack on Germany’s Ruhr Dams in May 1943, immortalised by the movie The Dambusters. 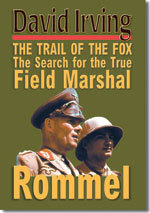 The author’s gripping account is based on his interviews with Bomber Command officers and official British and German documents, and on exclusive access to the private papers and diaries of Barnes Wallis – the British scientist who invented the unique “bouncing bomb” which smashed the dams. The book reads like a thriller, and will excite readers of all ages. Hardcover. Thirty-eight British and American cargo ships sailed in June 1942 for North Russia. On July 4, the British Admiralty ordered the escorts to turn back and escape, leaving each ship to fend for itself. Most were sunk. (David Irving's harrowing 1967 account of the drama resulted in a major libel action in 1970.) Large softcover. The Morell Diaries vanished in 1945, but turned up in 1981 in the National Institutes of Health, Maryland, USA, which transferred them to the National Archives. Was Hitler clinically mad? What diseases laid him low in 1941 and 1944 - at crucial moments in his nation’s history?David Irving discovered, transcribed, translated, and annotated the long-lost diaries of the infamous Dr Theo Morell, Adolf Hitler's doctor from 1937-1945; he provides a fascinating medical history of Hitler during his years of power. Laminate hardcover. David Irving's book-length account of how he was ambushed by the Austrian Stapo, the secret state police, in November 2005, and sentenced to three years' jail in the country's oldest, grimmest prison for a lecture he had delivered sixteen years before: Go figure. The trial, the imprisonment, and the legal battles are related in a way devoid of all rancour or hatred. Hardback. David Irving's history of the inside story of the controversial war crimes trial of Hitler's associates, based on the private papers and exclusive diaries of lawyers, judges, and defendants that were exclusively available to the author. Many unpublished color photos. Jacketed hardback. Thirty-eight British and American cargo ships sailed in June 1942 for North Russia. On July 4, the British Admiralty ordered the escorts to turn back and escape, leaving each ship to fend for itself. Most were sunk. (David Irving's harrowing 1967 account of the drama resulted in a major libel action in 1970.) Laminate hardcover. The story of Hitler's V-weapons the British Intelligence attack on them. The first edition had to be cleared by the Ministry of Defence, the Cabinet Office, the Foreign Office and the Prime Minister. This new edition contains the formerly excised chapters. Laminate hardback. 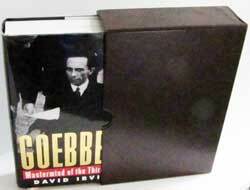 Edited by German historian Walter Görlitz, the gifted translation of Field Marshal Keitel's memoirs is by David Irving, author of The Destruction of Dresden and The Mare’s Nest. This latest edition includes additional commentary by Mr Irving. Laminate hardback. David Irving's facsimile record and commentary on the infamous American policy for postwar Germany. If adopted, the Morgenthau Plan would have led to the death by starvation and pestilence of ten million Germans in the first two years after the war ended, in addition to the one million who had perished in the saturation bombing and the three million killed in the enforced expulsion from Germany’s eastern territories. Both Roosevelt and Churchill unthinkingly initialled the Plan, as these documents show. Now for the first time in English. Laminate hardback. Until 1942 they were ahead of the Allies. Then a German mathematician made a crucial mistake, which forced the team of atomic physicists to believe they could only build a nuclear reactor with Heavy Water. The one factory which distilled that costly liquid, drop by precious drop, was in the mountains of southern Norway, vulnerable to bombing attack - and to sabotage by daring British Special Operations teams. (This book was previously published in North America under the title "The German Atomic Bomb".) Laminate hardback. In 1943 the Polish prime minister in exile, General Wladyslaw Sikorski, was killed in a British plane crash at Gibraltar. The Germans claimed it was an assassination. The RAF flew a Board of Inquiry to Gibraltar to investigate, and this cleared the pilot of blame. The death of the Polish prime minister came at a convenient moment for Winston Churchill. 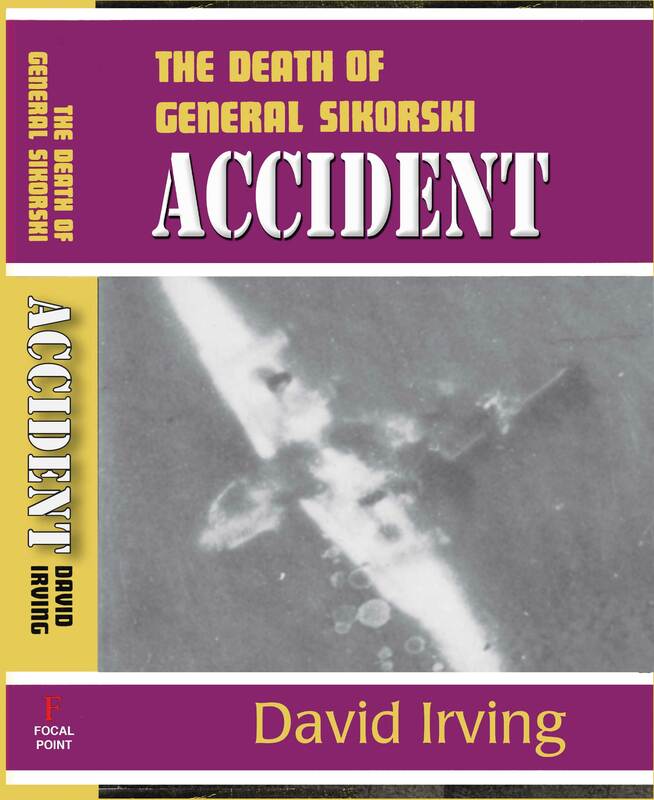 In this 1967 book David Irving investigates the mystery; he published the Board's secret report, and spoke with the pilot twice, and with others involved. Using official papers, private records, and the accounts of eye-witnesses on both sides, David Irving gives a harrowing account of the two saturation bombing raids executed by RAF Bomber Command on Germany's most beautiful city at the end of the war, a horrific firestorm raid which left over 100,000 innocent civilians dead or missing. Jacketed hardback. David Irving's best-selling history of the infighting between the top Allied generals during the 1944 invasion of Normandy, based on their unknown private letters and diaries. Used since then by every historian of that epic, it received brilliant reviews at the time. Laminate hardback. From February 3, 1933, when he told his generals in secret of his ultimate ambition to invade and conquer the East, to September 3, 1939, when he left the Berlin Chancellery for the Polish front, Adolf Hitler had one obsessive goal – to wage war and achieve German revenge and hegemony. David Irving's exclusive interviews with Hitler's staff, and his use of original and unpublished firsthand material led him across Europe in search of documents and correspondence. 350 pages including 27 pages of extraordinary illustrations, many never seen before. David Irving's standard work on the early years of Winston Churchill and his war, based, like his work on Hitler, on and interviews and documents exclusively available to him, and thirty years of research in British and international archives. This first volume chronicles an almost unbroken series of disasters in his life, from Gallipoli and the Chanak crisis to the defeat of France and the military fiasco in Greece. Jacketed casebound, a limited edition of a de luxe boxed copy, will be available to those who order early. David Irving's standard work on the middle years of Winston Churchill and his war, based, like his work on Hitler, on documents exclusively available to him and thirty years of research and interviews and British and international archives. The second volume of Churchill's War covers the middle years of this disastrous conflict. After the first volume chronicled an almost unbroken series of disasters in his life, from Gallipoli and the Chanak crisis to the defeat of France and the military fiasco in Greece, the second sees him enter happier times, with great naval victories, El Alamein and the landings in North Africa. This book is a "stand alone" book and does not require having read the first volume to understand or appreciate the story. Jacketed hardback. David Irving first published this best-selling biography of the second man in Hitler's Germany, the famous "six-star" general, Reichsmarschall Hermann Göring, in 1989; it received brilliant reviews around the world. Laminate hardback. David Irving was the first to find the secret British Intelligence and medical files on Churchill's prisoner, Hitler's deputy Rudolf Hess, who tried to stop the WW2 madness, and was given a life sentence for "crimes against the peace". Laminated hardback.